Bar breathalyzers are ubiquitous these days (and are totally for entertainment purposes only!) 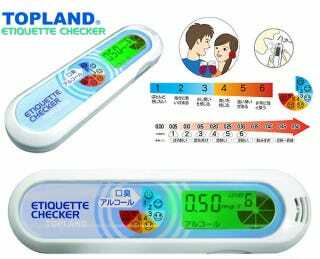 but the one from Topland offers something new: An etiquette checker! What that means, at least in Japan, is it checks for bad breath too. The science behind a device that claims to rate the stink factor of your maw is dubious to say the least, but let's review what Topland's promising anyway, just because. The unit displays six levels of breath detection, and will show you the "score" using one of the smiley face or sad face icons. The one to six scale rates the freshest breath as a "1" and the stankiest as a "6."